It’s been a record breaking week for Janet, setting personal bests in the pool, on the bike and in her sit to stand capabilities as well as her endurance in the standing frame. Health wise she seems very stable with regular BM’s and no obvious side effects from any of her meds. The Restoran ended today, (the magic poo pill) so it will be interesting to see how she does without that. Janet will visit her GP on Monday and part of that visit will be to assess all her meds and see if any further adjustments can be made. Dr. McCann is ordering an increase to Janet’s Baclofen dosage and I’m really interested to see if it has any effect. Janet has been on a very low dose for a long time now with no recognizable effect and if there is no change after the increase I’ll ask that it be discontinued. A week ago, Jess instituted a program for Janet where she writes the day’s activities on a whiteboard and Janet crosses them off as they are completed. Janet has caught on to this nicely, easily reading what each activity is and drawing a line through it when done. A couple days ago Jess supplied Janet with a digital watch to help her get a sense of the time of day as each activity occurs. Janet was puzzled by the watch, arguing that she has one at home but agreeing it was more a piece of jewelery than a useful piece of equipment. Janet can easily read her Connect watch but needs a lot of work relating to “today” as this morning she woke up thinking it was Christmas. She was still complaining to me when I got in this afternoon that “isn’t it time for grass?” Her code for Christmas. Janet’s day is centered around her physical activities as the emphasis remains on taking advantage of the Botox. Twice a day she rides the bike in the gym and continues to make steady gains in leg strength as a result. A week ago her personal best was thirty minutes and .83 miles using the arm assist. Today she went for thirty minutes and .62 miles with no arm assist at all! When Janet first started the bike she couldn’t even come close to pedaling without the arm assist. Similar benefits are being seen in the standing frame as Janet can now tolerate close to an hour twice a day. She doesn’t like it much but she tolerates it. As noted the other day Janet is also getting much better with her sit to stand exercises, so much so that she is getting a stripper pole installed in her room. For now it will be used to help her independently get out of bed and into her wheelchair, no dancing yet. As you all know Janet also is excelling in the pool and I expect that to continue improving each time we go. Our weekend at home was an enjoyable one with Saturday being a day off from physio therapy type stuff. I was reluctant to give Janet the whole day off but that’s the way it turned out and I think it worked out well as she slept in, pulled weeds in the sunshine with me, went for a walk around the neighborhood and made a really good sandwich for herself at lunchtime. We went to church Saturday night for a change and really enjoyed the music and Tim’s message. Janet was fully engaged and we had a good discussion about it all afterwards. Janet continued to be quite talkative well into the night and loved the sushi dinner we had as well as the movie The Guilt Trip. Sunday was a change from the usual as well. Tez was at Connect for a few hours and offered to work with Janet if I took her out there. They had a really good session of sit to stand work teaching Tiffany and Julie how to work with Janet should they need. Everyone learned a lot and Janet performed very well. I wanted Tez to see Janet on the bike to make sure all was well with her positioning etc. It was and liking what he saw he challenged Janet to pedal with no arm assist. She of course did it and is now going thirty minutes that way. After a nap at home while I cut the lawn we made dinner then went for a hot tub. By the time we got outside it was pouring rain but Janet laughed through it and had a good time soaking in the warm water as the rain passed through. She was exhausted after a long and busy day and was asleep before I finished our goodnight prayer. The weekend was capped off with a nice lunch with Kiko and Joel after swimming on Monday before the trek back to Connect. Janet seems to be getting more comfortable and confident at Connect but is also more aware that it is not home. Her interactions with the other residents are improving as she gains confidence in herself and gets involved in more things around the house. Instead of an interview this week I decided to have Janet give you a brief tour of her home away from home. Crank up your volume and enjoy. Many thanks to Joel and Kiko for hanging with us at the KGH Rehab pool today to cheer Janet on in her swimming sessions. Here are a few videos expertly shot by Joel so you all can see just how well Janet is swimming on her back. At the end of today’s sessions we tried a little face in the water while lying on her tummy action and she conquered that challenge easily. I was even scared a couple times at how long she was keeping her face in the water. The confidence continues to build. I promised I would publish updates whenever a worthy event occurred and so here is the first one. Janet swam for real today, all by herself! 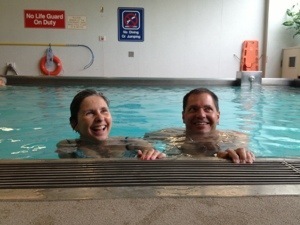 Our KGH Rehab pool sessions have been focusing on balancing and floating with my goal of trying to get Janet to swim. We started today’s first session with her floating on her back to get relaxed and loosened up. I held her from under her right shoulder waiting for a chance to let go when I felt she was relaxed enough. That moment came and she quickly sunk her face into the water then laughed. The giggles were a good sign I thought so I changed position and held her from under both shoulders and got her kicking her legs. Then I let go and off she went! Slowly and struggling a little but managing to keep her face out of the water and propelling herself forward. I had to stop her as she was headed for the parallel bars so we did a reset and with much less struggling she swam about half the length of the pool and was smiling big when she saw how far she’d gone. I let her rest for a bit and took her back down to the end for another attempt and without hesitation she was off like a fish all the way down to the other end in what seemed like effortless fashion. For the first time I believe Janet was truly excited and proud of what she had accomplished as she looked way down to where she’d started and said “that’s pretty far”. It’s farther than she thinks knowing how far she’s come along this past year. Amazing! The rest of our time in the pool today was spent trying to replicate that first full length swim and she did make it all the way again but not as effortlessly as that first time. During the second session her right leg wasn’t cooperating as well so everything she tried to do was diminished but overall it was a stellar day in the pool and even tonight when I reminded her of how well she’d done she didn’t argue or roll her eyes. Progress! Talk to you all Wednesday or unless another major event occurs before that. Remember you can follow me on Twitter to learn Janet news almost as it happens. I also hope to have video of Monday’s swimming thanks to Joel and Kiko. Twitter followers will of course see it first. It feels a little strange to be writing again after almost a week away from blogging. Thanks and welcome to all of you who have joined me on Twitter. That’s where you can now keep up to date with Janet on a daily basis. This past week has seen Janet steadily moving ahead in a lot of areas, with Friday marking the beginning of the end of her BM challenges I hope. We finally got the medication started that Dr. Agnew said would work, and boy did it! Janet felt relieved afterwards and I still don’t understand how she never felt any pain or discomfort during the long period of time where she wasn’t going. That may be part of why she wasn’t going and hopefully while at her colonoscopy appointment, Dr. Nash will be able to explain what’s happening. As of today all is well in that department. When I first met Janet she was challenging herself to become more assertive. As the years went by she learned to make sure her voice was heard very well. I’m starting to see a return of that strong personality now as she voices her opinion on things and has taken a few verbal shots at me. The funniest one being last night while watching basketball. I had been nagging Janet all afternoon about drinking water but hadn’t said anything for a while. Since it was nearing bedtime I casually suggested she needed to drink more water. She very quickly and sharply (smiling though) said “why don’t you drink more water”. Bob and I both laughed out loud along with Janet who promptly had a few big sips of water. I like what I’m seeing from her this way and although she still lacks confidence in her physical abilities she is clearly gaining a better understanding of her situation and the moment she is living in. Speaking of physical abilities, Janet continues to impress not only me but her therapists as well. I’m praying she soon recognizes herself how well she is doing. Friday’s sessions at the KGH pool were strong with Janet doing some good balancing and “walking”. In our pool on Monday Janet “swam” on her back for ten seconds on two separate occasions. I’m calling it swimming because she continued kicking her legs and moving her left arm to keep her face out of the water. There was some propulsion but hard to measure in such a short period of time and I was so excited I kept thinking how I could get video of it all. No luck with that yet. Janet was pleased I was excited but doubtful she had done anything that exciting. 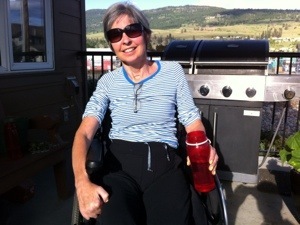 The hot tub continues to work its magic on Janet’s stretchability and she looks forward to those relaxing sessions now. If we could get her that interested in the Connect gym we’d be set. Janet is performing well there but still argues against going each time. The staff and I keep emphasizing the benefits she is seeing from all her hard work and I think we’re gaining ground there. Should be easy to do as Janet is getting measurably better on the bike, the standing frame and the parallel bars almost daily. On Monday she set a personal best riding the bike for thirty minutes and traveling .82 miles. Janet is tolerating the standing frame for forty minutes to an hour now and it’s so weird having her standing tall I can’t sit beside her when she’s in the frame as I’m not used to looking up at her. Meal prep and household type chores are something Janet strangely enjoys. She eagerly puts her laundry away and helps me make her bed. I still have to prompt her to look at the labels on her drawers to see where something goes and she needs a lot of guidance with kitchen duties but her willingness to try is cool and she really does concentrate fully when given a task. Janet and I went for a nice long walk Monday evening to explore the neighborhood. We saw a nice development with some single level homes for sale but decided we don’t want to live in Lake Country. I tested Janet’s vision while we were out by asking her to read signs and find certain objects. She can see things for sure, her challenge is in sorting out what she’s looking at and zeroing in on the key thing. It was a fun walk and Janet seemed to enjoy the challenge of finding things to look at, kind of like eye spy. The following is the first in what could be a weekly feature of the blog. This interview was shot this afternoon and its purpose is to allow you all to see and hear Janet for yourselves instead of just reading my words. We hope you enjoy. Praying for continued improvement and acceptance by Janet in how well she’s doing. My day with Janet began early, twice. I woke up around 1:30am freaking out that she wasn’t beside me in bed. I spent at least five minutes searching the main floor of the house and yelling for her before I realized she was sleeping soundly at Connect. Must’ve been the nachos. The day started for real with a Team Meeting at Connect at the more civilized hour of 9am. It was a good discussion, mostly about the positive gains Janet is making in all areas. The only real concern is her bowel movements but there is a plan in place. In brief, Tez is working towards independent transfers with Janet and is reluctant to try and predict whether or not she’ll walk one day. I believe she will. Mary Lou is seeing improvement weekly in Janet’s verbal skills and her vision and says Janet is getting pretty good with the iPad. I mentioned I tried having Janet go briefless at home without success and the team is supportive of trying to wean Janet off of the briefs during her awake hours. 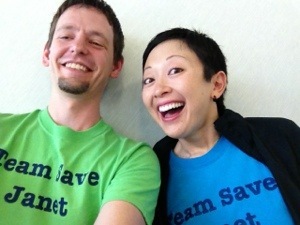 We are still waiting for the chance to meet with the neurologist Dr. Adams and the neuropsycologist Dr. Miller. Soon hopefully. Jess got Janet into the standing frame after the meeting and about twenty minutes in Janet announced she had to go to the bathroom and boy did she. Finally a bowel movement and credit to the increase in physical activity for her and maybe the Peg-Lyte. Janet felt a lot better after that and went to the gym for a little bike ride and a good stretch. We went for a walk to the hot dog stand across the street for lunch but the guy wasn’t around so back to Connect we went and Janet BBQ’d us a couple of smokies. She was pretty tired after lunch and had a good long nap with no resistance at all. I think the last few days finally caught up to her. Unfortunately she slept through a chance to work with Tez at the parallel bars but he agreed to come in tomorrow morning and work with Janet before swimming. While we sat outside for happy hour I noticed how loose her right arm was and decided to see how much I could move it around. As you can see I was able to get in a position it hasn’t been in for a long time. Impressive. As I was getting Janet up from her nap I mentioned I wanted to tell her what happened to me last night but would wait till she was totally up. Fifteen minutes later she asked “what about the story you were going to tell me?” This was one of many super bright moments Janet had today as she continues to gain cognitively. After dinner we had quite a serious discussion about “my problem”, with Janet asking lots of questions about herself and Connect. There were tears of course as I didn’t sugar coat anything. She asked, I answered and I think this is great progress. That level of brightness was only with her for about an hour or so and as she tired towards the end of the night her speech got a little garbled again. She did manage to lounge for a good while and watched some basketball before lights out in readiness for a busy day tomorrow. This post is the last daily update I plan on writing as I find too many days are pretty routine and don’t require the effort it takes to produce an update. I will publish at least every Wednesday evening from now on and as events warrant. Those of you who wish to stay totally plugged in can follow me on Twitter @larrylatour where I will post daily with photos and or video. Praying for a restful night that provides lots of energy for tomorrow. Janet was at it early this morning working out with Tez doing some standing and walking at the parallel bars. Janet still says it’s difficult but she isn’t quite as emotional about it all as before. She still has not had a BM even with the Peg-Lyte so nurse Jen recommended a trip back to ER and that was suggested by Janet’s GP as well. I had hoped to delay the return until tomorrow in part because today is the one year anniversary of Janet’s aneurysm and the last place I wanted her to be was the hospital. However it was the right thing to do. Lorne took Janet from Connect to KGH and I met them there, saving me a trip out there and back. 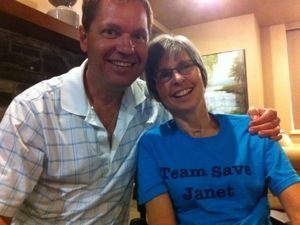 Janet was in good spirits and seemed OK with the idea and prepared to wait. The ER wasn’t nearly as busy today so I had high hopes we’d be in and out pretty quick. Last time was five hours, today two and a half. Dr. Eppler saw Janet today and he confirmed that it was good we brought Janet back in but at the same time he wasn’t ready to bring out the dynamite yet. He consulted with Dr. Agnew, the GI, and he recommended a drug that Dr. Eppler had never heard of and the KGH pharmacy didn’t have in stock. He seemed super confident in it though and also ordered Janet to be on a slightly different formulation of the Peg-Lyte she’s been drinking and that should help Janet stay regular once she gets cleared out. He gave Janet a dose of it as we left and she drank it quickly on the way back to Connect. The plan now is to try this new drug along with the new Peg-Lyte and if there’s no result soon Janet will go back to the ER for the dynamite treatment. It was dinner time when we got to Connect and Janet ate heartily. Not sure where all the food is going but she seems fine. Garrett negotiated a bike ride from Janet afterwards and she performed her best ever. The deal was more than twenty minutes but less than thirty. I went in to see how she was doing and she just eclipsed the twenty five minute mark. I didn’t let her know I was there and she continued until she went over twenty eight minutes. Garrett and I showered her with praise hoping it sinks in that she is improving. The praise continued as Janet took a much needed bio break and produced a very small BM. Something is better than nothing and I credit the long bike ride with moving things along a little. Janet was quite insistent that the rest of the evening be fun and she elected to lounge while watching basketball in the living room. That was a perfect way to end another busy yet productive day for her. I thought about a lot of different ways to acknowledge this anniversary. A video timeline or a re posting of key events along the way. A photo montage showing the very obvious progress Janet has made or having her say stuff on camera today. As I thought about it and talked about it with her it became clear that celebrating this day would be inappropriate. Janet still gets very emotional thinking about the past year and even though she doesn’t remember much it still brings tears. I don’t want to generate more tears. I also realized that the anniversary probably means more to those of us who have been alongside Janet during this journey than it does to her. So in that regard I want to thank all of Team Save Janet for your continued prayers, visits, virtual visits, care packages and words of encouragement. Janet and I would not have managed to get this far this well without all of you. Looking back at how much has changed in the last year I have nothing but optomism for what the next year holds. God continues to place the right people in our lives at the right time and through His grace all will be well.